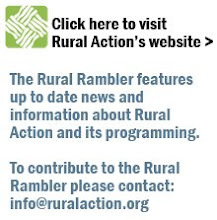 The Rural Rambler: Energy Events Coming Up in Columbus - Energy Efficiency This Winter and Beyond! Energy Events Coming Up in Columbus - Energy Efficiency This Winter and Beyond! From the Rural Action Energy Commitee comes this report of two exciting events to help you save energy (and money) while increasing the value of your most important investment. During the first week of December, nearby Columbus will be hosting two events to help bring energy efficiency home, a moisture management workshop on December 1st and the Green Home Fair on Saturday the 5th. Read on for details and how you can attend. This four hour workshop will address moisture management issues for a whole house, from roof to basement, when retrofitting existing (gut rehab) or building new energy efficient homes. The speaker, Joseph Lstiburek, Ph.D., P.Eng., ASHRAE Fellow, is a principal of Building Science Corporation. Dr. Lstiburek has appeared on PBS NOVA ("Can buildings make you sick?"). techniques and heads one of the four Building America program teams for the U.S. Department of Energy. Dr. Lstiburek has written numerous books and technical papers on building construction. He is the best selling author of the Builder Guides and has over 50 technical and journal articles to his credit. He has conducted forensic investigations and served as an expert witness on building failures all over the U.S. He is an expert in the areas of rain penetration, air barriers, vapor barriers, air quality, durability and construction technology. Registration is $35 per person. A Green Residential Tradeshow & Conference Free & Open to the Public! 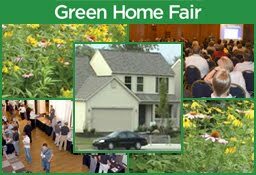 Additionally, the Green Home Fair will have exhibits of Green products for Residential home construction/retrofit and everyday use. The Fair is a gathering of homeowners and residential building industry professionals. Participants can come and go as they please, choose to attend the educational sessions or just walk through the exhibits! Best of all this one's free! So get out there, though it may be dreary outside, green is a color we can carry with us all year long!